Discussion in 'Apple iPad News' started by iDan, May 5, 2010. 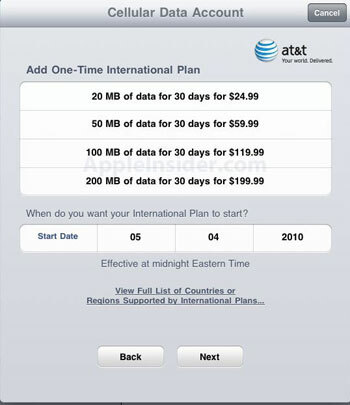 AppleInsider has a report today listing AT&Tâ€™s international data plans for the 3G iPad, and as is usually the case with roaming charges, theyâ€™re not cheap! According to AppleInsider, all things considered, the cost roughly amounts to $200 for 30 minutes of streaming YouTube videos. There are four Data Global Add-On packages to choose from, with tariffs starting at $24.99 per 30 days for 20 MB of data, and soaring as high as $199.99 for 200 MB. Somewhere in the middle of that you have 50 MB of data for 30 days for $59.99, and 100 MB of data for 30 days for $119.99 The plans can be ordered directly from your iPadâ€™s Cellular Data screen on a month-by-month basis. AppleInsider suggests that a cheaper option for iPad owners travelling abroad might be to purchase a pre-paid data micro SIM from a local carrier in the country youâ€™re visiting. Once the iPad 3G is finally released in Europe and elsewhere weâ€™ll probably know more about how possible this will be. Not gonna pay those rates no matter how magical is this gizmo. I imagine that it is not too far off what the iPhone costs for the same service. If I can afford to go to Europe, I would just find a lot cheaper way of getting phone service. That seems a bit excessive. My company has AT&T for our iPhones; they only charge us $10 per month for international usage, plus whatever the actual cost is for the call. I realize there's a difference, but that's exorbitant. These are the same rates as the iPhone international data plan. That may be the problem then: with the exception of a few text messages, the phone is only used as a phone, not for data. So I haven't seen those kind of rates! There are so many bad feedback on the internet supplier for Apple's iPad. They kept on complaining that the signal is not really accessible to everyone.